Pat was survived by his loving wife and best friend of 64 years Barbara, sons’ Brian (Jackie)Kamloops, Gary (Jamie)Kamloops, Dave (Deanna) Clearwater, daughter in law Cindy, Lamont Alta, and 20 cherished grandchildren and 19 great grand children. He was predeceased by his parents and 3 brothers and sisters-in-law, and then his son Barry in 2016. Pat was born on March 17, 1932 (St Patrick`s day) in Calgary Alta. 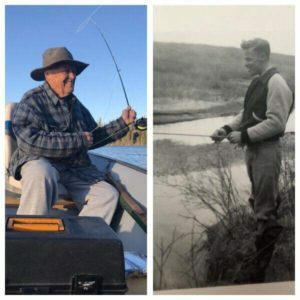 In his early years he spent lots of time hunting and fishing with his dad and 3 brothers and has continued to do so with his boys and grandchildren until he became ill. Recently he has had a couple of last fishing trips and thoroughly enjoyed them. In 1952 Pat started work with Royalite Oil in Calgary in the accounting dept, where he met the love of his life Barbara at work. They married in 1954. He took a transfer to the Kamloops refinery in 1968 and worked the rest of his career with Gulf oil until he retired in 1983. After the purchase of their new house in 1970, he began landscaping and gardening to create the beautiful yard that he was so proud of until the end. Pat had a green thumb and could grow anything. He spent many hours planting, weeding and harvesting. His hard work was enjoyed by his family, friends and neighbours. His other loves were fishing, hunting, and camping, and he spent as much time as possible with all the family pursuing these interests. Pat has now joined Barry on a long fishing trip and will be forever loved and remembered for his dedication to his family. Keep your lines tight, till we meet again. In lieu of flowers donations can be made to the Canadian Diabetes association, the BC Kidney foundation, or a charity of the donors choice. Dave, you’ve always been so special to our family and reading the tributes to your dad it’s easy to understand why! Our hearts hurt for you and your family as there are no words that ease your loss, just know we love you and are so glad your part of our family! I’m so sorry for your loss.May you find peace to ease your sorrow.There is comfort in the memories of our loved ones. Embrace them,for they are gifts that will remain forever in your heart. I”m so sorry to hear about your loss. May you find peace to ease your sorrow. There is comfort in the memories of our loved ones. Embrace them,for they are gifts that will remain forever in your heart. My condolences to you and your family , my thoughts are with you . I was very saddened to hear of Pats passing. Pat and my mum, Jean McElgunn worked together for many years, both starting out at Royalite. Mum always spoke fondly of Pat. It does no matter how old someone is when they go, they are still very much missed and leave a sad and empty place in your life. Keep him in your heart and keep your memories of him close as I have been doing since my mum passed last October. We are so very sorry to hear of Pats’ passing. Pat will be remembered as being a kind and caring person.